Kim Jong Un is well on his way to becoming the most prolific builder since his grandfather, Kim Il Sung. There are the new roads, the billions spent on construction projects in Pyongyang and in other major cities, modernizing airports and constructing new ones, and much more. Kim Jong Un has been busy as he enters his seventh year in power. Those further changes to North Korea's military airbases and other runways, as well as the stunning advancement of their ballistic missile program makes it necessary for me to write, once more, about the ever-progressing nature of North Korea's military. There are three main areas of focus for this post. The first is the construction of multiple new aircraft parking revetments at new and older emergency runways. The second is the construction of more emergency runways. And the third deals with the possibility of the merging of North Korea's major airbases and ICBM program. North Korea has 111 airports, airbases, heliports, emergency highway runways, and other landing strips. Particularly since 2016, nearly all of their emergency highway runways (straight sections of road that have been widened for use by aircraft in the event of a war) have had aircraft parking revetments constructed to augment each site. Additional basic runways have also had revetments constructed. In all, 15 airfields have had new revetments constructed. The number of revetments varies between one and four (most have three), but there is a grand total of 39 individual revetments which could support a combined 75 aircraft (at least) depending on type and parking arrangement. It's important to note that not all of the satellite imagery of all of the different air facilities in North Korea has been updated to include either 2016 or 2017 imagery, so it's possible there are other sites that have had revetments constructed. I just can't yet see them. Here are some examples of these sites. Click on any image to see an enlarged view. 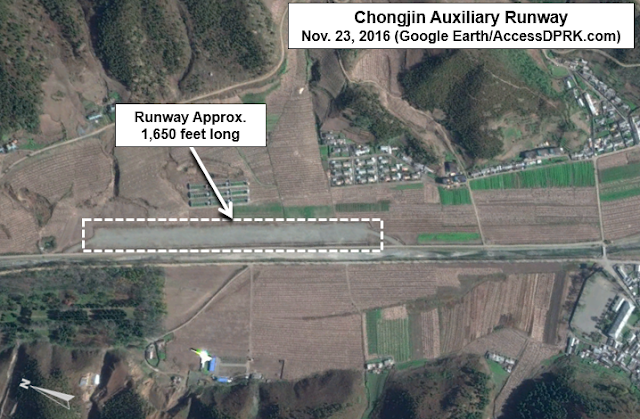 Since my 2015 article on the North Korean Air Force and the changes that have happened under Kim Jong Un to the physical infrastructure of the Air Force and general aviation, at least three additional runways have been constructed. This runway is also approx. 3 miles (4.8 km) north of a military training base that underwent fairly substantial expansion in 2013. This small auxiliary runway was constructed in early 2016. This runway is being constructed across from the large Sunchon Cement Factory. Curtis Melvin at North Korean Economy Watch believes that this will be a new 'executive' runway for use by Kim Jong Un and other high ranking officials. What makes it odd, in my mind, is the fact there are two large military airbases (and a helicopter base) within 12 miles (19 km) of this new runway - after all Sunchon is an important industrial city. Perhaps the 30 minute drive was a bit too much for the Supreme Leader. North Korea has a history of testing missiles from their airports, particularly at Wonsan (Kalama) and Pyongyang International. During the modernization and expansion of Wonsan, an observation facility was constructed as well as two concrete launch pads on the beach. 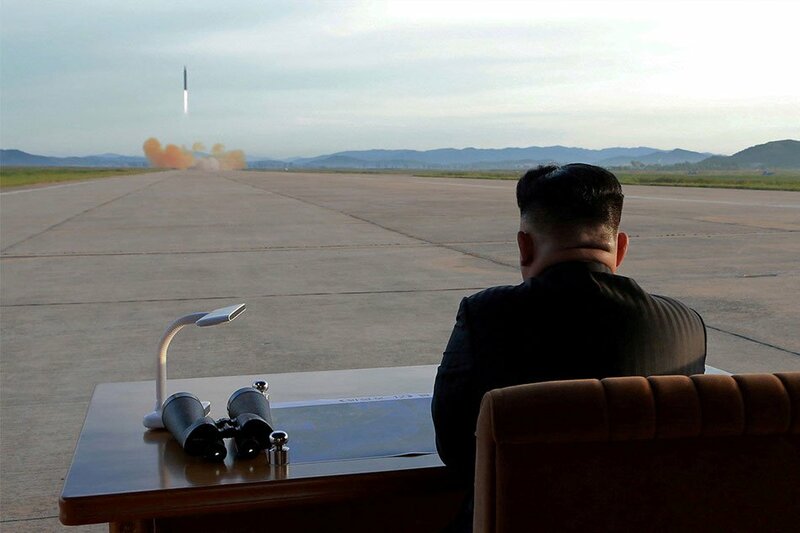 And as you can see in the opening image of this article, Kim Jong Un observed the test of a Hwasong-12 ICBM from Pyongyang International. But unlike Wonsan, the Pyongyang launch was carried out on the bare ground. Along the line of launch pads, there has been a curious development at 19 of North Korea's major air facilities. Starting in 2015 and extending into 2016 (such a busy year), twin squares of concrete began to pop up at these airbases. Unlike the small launch pads seen at Wonsan or other sites, which are approx. 60 x 80 feet (18 x 24 meters), these new pads are each roughly 165 x 140 feet (50 x 43 meters). All but two airbases have two of these pads, one at each end and directly in line with the runway's path, but not connected to it. The other two just have a single pad. Most are made of concrete, but a few are simply areas of cleared land and compacted dirt. My initial thought was that these were helipads, but they're much larger than most helipads in the country. Additionally, these are military bases and space already exists for helicopters. Furthermore, Pukchang Airbase (near Sunchon) has an adjacent helibase with dozens of helicopters stationed there, yet the main airbase also has these new pads. Use of these sites for helicopters is also lessened because the pads aren't directly connected to the runway and are separated from them by around 170 feet (51 m). I am not an aviation expert, but I have explored the globe via Google Earth (and been to a few airports) and I have yet to see this layout anywhere else. My second thought then became, what if these are actually meant to allow rapid deployment of various missile systems? (Their size would accommodate everything in North Korea's arsenal.) I have asked for the input of others but wasn't able to get much more than "that's plausible", with no other firm alternative explanations. So perhaps North Korea now has 36 new ICBM launching sites, or maybe it's something else entirely. The fact these things popped up across the country, basically overnight, are fairly uniform in size, and are only located at major military sites, impels me to at least bring attention to them. These two images shows the pad area at Kaechon Airbase before and after construction. This next set of images is just a sample of different bases with the pads. Here is the list of coordinates for each of the airbases with these pads. My ego isn't so fragile that I can't handle correction. If you think (or know) I have misidentified these sites or can offer a plausible alternative, please let me know!